Short text about the current dynamics of what we have called "the era of riots". It was written before the events in Brazil. These events include the 4th of the dynamics in the "era of riots" and ask the question of the stage of the crisis we are in (Brazil and Turkey were the IMF miracles). But of course the analysis of this correlation is not elaborated in this text. The social explosion in Turkey makes it imperative to examine more closely what is happening, what is being produced, what the new limits produced in the period we call the era of riots are and how these limits will be overcome. The combination of the events in Sweden and Turkey, their temporal encounter, confirms the existence of two dynamics of class struggle, which develop each with its own relative autonomy. We cannot overlook the fact that the anticipated encounter between these practices is not likely to be harmonious and that it will raise the issue of how two historically produced "subjects", which in their current activity have no common horizon, relate to each other. The issue, however, from the perspective of the revolution, is how, on the basis of this anticipated encounter, the necessary overcoming of these subjects is produced, how their struggle is transformed into taking communist measures against capital, i.e. into a questioning of all social roles that constitute society, into communisation. On the one hand we have the riots of the “excluded”; on the other, from 2011 on, there has been a succession of riots whose most important element, in terms of composition, is that the so-called “middle strata” are involved, and their "democratic" discourse is constitutive for the movements produced. The riots of the excluded appear in countries which are high in the capitalist hierarchy. On the other hand, the riots that are dominated by the democratic horizon, which is politically constitutive for the middle strata and formative for the movements of the “squares”, take place mainly in countries in the second zone and the so called “emerging economies”. The fact that a country which does not belong in these zones, Spain, is part of this grouping suggests that the crisis affirms the undermining of this stratification, which had already taken place over the course of this cycle of accumulation (from the crisis of the 70s up to about 2008). These dynamics have not yet come into play in the very core (USA-Germany). The Occupy Wall Street movement, although it gave its name to the second dynamic, only marginally fits in it: it was an activists’ movement (Blockupy in Germany was of the same sort), not a mass movement, such as the movements in Spain, Greece, or the "Arab Spring" and the current movement in Turkey. Those who are radically excluded from the official circuit of surplus-value production (this is their way of being integrated into capitalist society: inclusion by exclusion) do not articulate any (political) discourse, their only language is looting and destructions. They do not demand anything because for them it is already given that demanding is meaningless (otherwise they would have had demands), they already know that the state is not going to bring about their integration, but it will try to manage them as a surplus population. As the crisis / restructuring which has unfolded since 2008 further scraps “social expenditure”, it is clear to them that this management becomes more and more repressive. In fact, they asphyxiate in a “prison without bars” (when you cannot afford to leave your neighborhood and you are constantly cornered by the police, you are imprisoned). Within this “prison”, community relations cannot offer salvation from everyday misery and to an extent they enter the parallel exchange economy, petty crime, i.e. informal institutions which reproduce a cruel, oppressive hierarchy (not to mention the position of women). So by attacking their prison, by attacking all state institutions that define them as prisoners for life, they challenge, in their revolt, their social roles within that “prison” they find themselves in. The middle strata rebel because they are collapsing middle strata (Greece, Spain) or because they are not allowed to constitute themselves as such (Arab Spring) or because they are much more repressed and economically squeezed compared to the pre-crisis period (Turkey), something that involves not only their lower-than-what-it-"should"-be income, but also all other social relations, the commodification and enclosure of public spaces, gender, politics or politics-and-religion, which in the case of Arab countries are aspects of the same thing, race etc. The question of the middle strata is an open theoretical question. Their very definition is fluid: The traditional definition of the middle strata included categories of small (property) owners of means of production and traditional individual professions (doctors, lawyers etc.). Today, however, how can one define the middle strata? This social stratification is largely present within the waged and self-employed (i.e. employees who contribute part of their wage to the social security system) and it is based on one’s position within the production process, their income, access to credit etc. And subsequently, the masses of impoverished unemployed, the de facto poor youth and the precarious workers, push down the “status” of what can be called middle strata, and reduce their political influence within the state. These two dynamics, the riots of the excluded and the mass public space occupations movements, in which these fluid middle strata play a major role, intersected with each other in February 2012 in Greece (but in this case the middle strata were already collapsing). This intersection was the result of the particularities of Greece. One cannot ignore that before “Syntagma 2011”, “December 2008” had taken place. 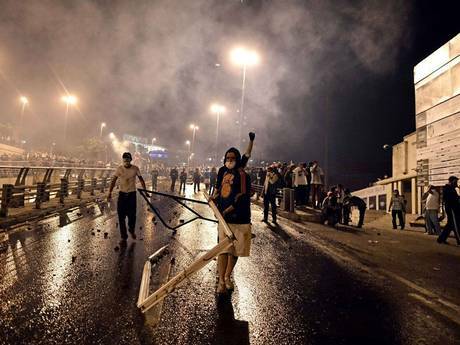 The December 2008 riots, as the student riots in Chile and Canada, are inscribed within the range of practices varying between these two dynamics. In these riots the “youth” emerges as a socially constructed subject consisting of men and women who find all the doors closed, who are not going to climb the ladder of social mobility, but at the same time they do not find themselves structurally excluded like the "troublemakers" of Stockholm and England. A) Will the state be able to build the consent of the proletariat in the countries of the first zone to a management that turns against the excluded? This tendency appears to be produced as the almost inevitable response to the contemporisation of this dynamic by the events in Sweden (the emergence of the EDL as well as the increase of the political influence of the UKIP in England are directly linked to this issue, an emergence that could not take place following the 2011 riots which were much more white). The riots in Sweden update the crisis of the integration of the proletariat into the process of surplus-value production as a crisis of immigration. The issue of a new type of fascism, orientated towards the creation of a “European identity” and thus with an intrinsically racist content, is on the agenda. B) What is the internal dynamic of the absorption of the “middle strata” into the proletariat, not only as a situation but also as an activity? Is there a chance that the practices of the “commune”, of those who defend themselves in the squares and try to rescue their class belonging, meet with the destructive practices of the excluded? To date, the only such indications are the conflictive encounter in March 2006 in France during the anti-CPE movement, an event that is already outdated and took place before the crisis, and the 12th of February 2012 events in Greece, an encounter that was nevertheless immersed in the confrontation around the “memorandum” and could not endure following the defeat of its specific demand. What can be the outcome of the “democratic movements” which, at least to date, cannot be incorporated into the state? These movements exhibit a certain “communitarianism”. The latter’s starting point is the defence of state property (nothing is “common”, whatever is not private is state property) which is to be used according to its definition, namely as an element that underpins the reproduction of labour power. The squares or the parks are spaces of “free” time. The fact that unemployment has been significantly increased by the crisis/ restructuring allows for a significant number of people to be continuously present in such spaces during the movement. The fact that whoever has a job joins after work is not surprising; in the evening and at night many more people are present. What is important is that a “common life in the occupation” is produced. The “life in the occupation” is certainly an image from the future that surpasses the horizon of the movement. However, it cannot be substantialised as a generalised practice to the extent that the movement does not really question the structure that supports the distinction between public and private space, namely, in the last instance, the totality of capitalist relations. The “community of struggle”, the “communist gestures” should not be underestimated because in their generalisation they are the positive horizon, but in the stage where we find ourselves today we are obliged to look for: on the one hand what hampers the movement and does not permit an effort to generalise these elements, and on the other hand which elements of its content are at the same time the causes of its ending. Participants in these movements, contrary to the riots of the excluded, consider it very important to territorialise their presence (something not unrelated to the significance of the rent form that the surplus-value produced in modern capitalism acquires; exploitation has a defining role in the form of class struggle). By “occupying” they claim the right of their material existence as a subject facing the state, which they believed to be “attentive” to their needs. It is not least important that the commune is being defended against the police mostly by a young, male and poor part of the proletariat, which is experienced in fighting the cops (the distinction of this role appeared in Turkey as well, although to a lesser extent compared to Egypt). Demands are being necessarily sought, so that something more concrete than “democracy” can be brought to the assumed negotiation table (which participants cannot accept does not exist anymore, continuously calling the government to acknowledge its existence). This process, due to the government’s refusal to negotiate anything, naturally ends up in the government itself being questioned. Since the composition of the movement is dominated by the middle strata, it necessarily demands the stepping down of the government, and such a demand, given the absence of a “party of the working class”, implies that it is to be replaced by another government (one that would be able to support the existence and reproduction of the quality of life that they believe they deserve). This endogenous tendency does not find itself in contradiction with the communitarian characteristics of the occupations, which are nevertheless undermined as constitutive and formative elements of the movement when the political objective concretises itself. Egypt and Tunisia have illustrated that, indeed, the fall of the government marks the end of these movements. In reality though, what initially appeared as a victory proved to be a defeat, as new police states have been established and the restructuring advances as normal, with the scrapping of benefits, increases in food prices etc. However, the movements in Egypt and Tunisia were not able to stand on their feet again, as their initial goal that corresponded to their unity was achieved. Turkey, the next landmark in this dynamic, which despite its differences belongs to the same schema, as a social movement has to face another aspect of the situation. The government’s political power is larger compared to Egypt and Tunisia. The unity of the movement is based on the transformation of the state into a police state over the last years. The question is: can the middle strata be absorbed into the proletariat, as an activity that questions capital, if these movements do not end with their political victory (namely their actual defeat)? Their defeat, which passes through their political victory, necessarily brings existing divisions to the surface. Part of the movement tries to continue the revolt, which however ceases to have popular support (namely inter-class support, given that class is a relation not a category). Without the mass participation of the excluded and the poor, how can this process of revolt continue? Is that possible? The movement in Turkey is still going on while this text is being written. Its particularity, added to the fact that it is an event of global significance, determines the point where we find ourselves. Here is where we are: in a revolt that broke out in yet another police state. A revolt with little chance of “victory” on the ground of its content and of such importance for precisely that reason. The practices of the “commune” that have as their necessary horizon a better management of the bourgeois state, an horizon that in the end is called into question, encounter the revolts of the excluded in the fact that the latter ones do not even have the horizon of a “victory”. The outcome of this encounter, that will be decided among other things by the interaction between the practices of the commune and the practices of everyday survival by those structurally excluded from the official circuit of surplus-value production, will decide to a large extent the outcome of the class struggle in the era of riots. I thnk that it's from the French to claim, as in claiming higher wages or better conditions. As far as Turkey and Brazil goes, one of the lines of the bourgeoisie has been that these are expressions of the "middle class" and the "middle strata". While non-bourgeois elements are involved, shopkeepers and the like, the protests in these two countries look to me to be overwhelmingly of a working class constituent. In Britain the demonisation of unemployed workers is a position that is engendered from the highest levels of the state, the Tory government supported by the Labour Party and de facto the trade unions. I agree with the text that democracy is the big danger - not just to these movements but for the whole of the working class and that fascism isn't anywhere on the agenda. These movements of revolt are obviously very heterogeneous and there are the specifics of different countries and their respective oppressive apparatus. But overall this is a movement that comes from a young proletariat, a very dispersed proletariat, trying to find spaces from capitalist society in which it can begin to express itself and not without significant support from older generations. I had the same question. According to this - http://www.wordnik.com/words/revindication - it means demanding restoration of something. So in this article I take it to mean downwardly mobile people’s demand for a halt on downward mobility.